The World Health Organization (WHO) has recommended a fixed duration of multidrug therapy (MDT) for paucibacillary leprosy which is currently widely implemented in India. A clinico-pathological study was initiated in 1984 to assess the efficacy of this regimen. The clinical and histological responses of the patients to MDT were assessed at the end of 6 months, when their treatment was stopped, and at 2½ years, when they were released f rom surveillance, and compared with the responses of a matched patient group to conventional dapsone (DDS) monotherapy during the same period. Of 28 patients who completed the MDT schedule, there was less than 60% improvement in 33% of them when treatment was stopped at the end of 6 months and in 20% of them at the end of 2½ years. Of 26 patients receiving DDS monotherapy, 37% showed less than 60% improvement at the end of 6 months but only 8.8% had less than 60% improvement at 2xh years. It is concluded that MDT for paucibacillary leprosy as recommended by WHO may not have a major advantage over DDS monotherapy, since about 20% of those patients on MDT continue to have evidence of active disease when discharged f rom surveillance. L'Organisation Mondiale de la Santé (OMS) a recommandé une durée fixe de traitement par polychi-miothérapie (PCT) pour la lèpre paucibacillairc, et cette recommandation est largement mise en pratique en Inde. Une étude clinico-pathologique fut mise en route en 1984 pour évaluer l'efficacité de ce régime. Les réponses cliniques et histologiques des patients à la PCT furent évaluées à la fin des 6 mois, c'est-à-dire à l'arrêt du traitement, et après deux ans et demi, c'est-à-dire à la fin de la période de surveillance. Ces réponses furent comparées à celles d'un groupe de patients recevant une monothérapic conventionnelle à la dapsone durant la même période. Parmi les 28 patients qui ont terminé leur traitement par PCT, il y a eu une amélioration de moins de 60% chez 33% d'entre eux à l'arrêt du traitement après 6 mois, et chez 20% d'entre eux après 2 ans et demi. Parmi les 26 patients qui ont reçu une monothérapie à la dapsone, 37% ont montré moins de 60% d'amélioration après 6 mois, mais seulement 8.8% avaient moins de 60% d'amélioration après deux ans et demi. On en conclut que la PCT pour la lèpre paucibacillaire telle que recommandée par l'OMS ne paraît pas présenter d'avantage important par rapport à la monothérapie à la dapsone, puisqu'environ 20% de ces patients sous PCT continuent à montrer des signes d'activité de la maladie à la fin de la période de surveillance. La Organización Mundial de la Salud (OMS) ha recomendado una duración fija del tratamiento con múltiples drogas (TMD) para los casos de lepra pauciba-cilar. En 1984 se inició un estudio clínico-patológico para evaluar la eficacia de este tratamiento en la India. Las respuestas clínicas e histológicas de los pacientes al TMD se midieron al final de los 6 meses, cuando el tratamiento fue suspendido, y a los 2 años y medio, cuando los pacientes fueron liberados del seguimiento. Los resultados se compararon con los obtenidos en pacientes tratados sólo con dapsona (DDS) durante el mismo periodo de tiempo. Dentro del grupo de 28 pacientes que completaron el tratamiento, 33% de ellos mostraron menos del 60% de mejoría al final de los 6 meses de tratamiento, mientras que al final de los 2 años y medio, el 20% de ellos mostró ese grado de mejoría. De los 26 pacientes que recibieron la mono-terapia con DDS, 37% mostraron menos del 60% de mejoría al final de los 6 meses pero sólo el 8.8% tuvieron menos del 60% de mejoría al final de los 2 años y medio. Se concluye que la TMD recomendada por la OMS para la lepra paucibacilar no presenta muchas ventajas sobre la monoterapia con DDS puesto que cerca del 20% de los pacientes bajo TMD continúan teniendo evidencias de enfermedad activa cuando son puestos fuera del programa de seguimiento. This study was initiated at the Christian Medical College Hospital, Vellore, India, in 1984, about 2 years after the World Health Organization (WHO)-recommended multidrug therapy (MDT) became the standard for treating leprosy patients in India. The objective of the study was to determine the efficacy of MDT as recommended by WHO for paucibacillary leprosy as compared with that of conventional dapsone monotherapy. All consecutive new patients with a single leprosy patch who attended the dermatology clinic were screened. The following were the exclusion criteria: a) children younger than 5 years; b) facial lesions; c) patches less than 2.5 cm in size; d) patients who were unable to come for periodic follow-up for 2xh years; and e) patients who had already received any form of antileprosy treatment. Fifty-four patients were included in the study. At the initial visit, the clinical classification was recorded and skin smears for acid-fast bacilli (AFB) were taken from the edge of the patch. A skin biopsy was taken from the margin of the lesion, and a lepromin test was done using the Mitsuda antigen. The patients were then randomly allotted to one of two therapeutic regimens. The clinical classification was based on the morphology of the lesion and the perception of light touch over it. The color and size of the lesion were recorded. An ill-defined hypopigmented, hypoesthetic or nonanesthetic patch was classified as indeterminate leprosy. A well-defined, hypopigmented anesthetic patch or a well-defined erythematous anesthetic plaque was classified as tuberculoid leprosy. An ill-defined hypoesthetic or anesthetic patch or a plaque with satellite extension was classified as borderline tuberculoid leprosy. The histological classification was based on the character and intensity of the dermal infiltrate (7) and the number of AFB, if present. Lesions showing perineurial or intraneural lymphocytic infiltration were classified as indeterminate leprosy. Lesions with well-defined tuberculoid granulomas with many lymphocytes in the dermis and dermal nerve twigs were classified as tuberculoid leprosy. Lesions showing ill-defined, small tuberculoid granulomas with many epithelioid cells and a sparse lymphocytic infiltrate in the dermis and dermal nerves were classified as borderline tuberculoid leprosy. 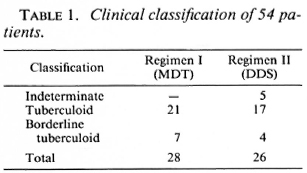 The lepromin responses were assessed clinically on the 21st day after inoculation of the antigen by measuring the resultant induration at the test site. The test site was biopsied and examined histologically, irrespective of the presence or absence of induration. An absence of induration or a 1-3 mm area of induration at the test site was recorded as a negative response ( - ); a 3-5 mm area of induration, as a doubtful response (±); and induration over 5 mm, as a positive response ( + ). Histologically, a nonspecific cellular reaction at the biopsy site was considered as a negative response, while a positive response was characterized by a tuberculoid granuloma in the dermis. Two therapeutic regimens were adopted. Regimen I was the WHO-recommended multidrug (WHO/MDT) treatment for paucibacillary leprosy (8) consisting of rifampin 600 mg administered once a month under supervision for 6 months along with dapsone (DDS) 100 mg daily for the same period. Children were given appropriately smaller doses. Regimen II consisted of dapsone monotherapy with daily doses of 50 mg for 5 years. Patients on Regimen I were seen once a month for the initial 6 months and then at intervals of 6 months up to 2½ years from the time of initiation of treatment. Patients on Regimen II were seen at intervals of 6 months. Clinical and histological assessments were made at 6 months, 1 year, 2 years, and 214 years. The clinical response was assessed on the basis of changes in color, size, and sensation of the lesion. The histological response was evaluated for changes in the size and character of the infiltrate. Follow-up assessments were made by the same clinician. Fifty-four patients between the ages of 7 and 67 years were studied. Of these, 33 were males and 21 were females. Of the 54, 28 received therapy according to Regimen I (MDT) and 26 received therapy according to Regimen II (DDS). 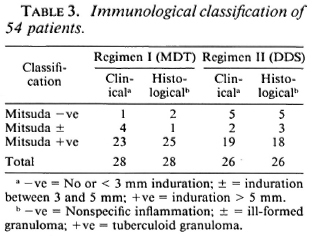 The clinical classification, histological classification, and immunological status as determined by the Mitsuda reaction of the 54 patients are shown in Tables 1-3. Clinical assessments on follow-up proved difficult, even though these were done by the same observer each time. Assessment of color, size, and sensibility of the lesion were vitiated by the presence of multiple biopsy scars. The histological assessment appeared to be more reliable. Four follow-up biopsies were done for each patient, but only the data at 6 months and 2½ years are presented. One patient in the MDT group and two patients in the DDS group did not come for follow-up assessment at 6 months. The histological response of 27 patients in the MDT group and 24 patients in the DDS group after 6 months of therapy are shown in Table 4. A poor histologic response was observed in 5 patients on MDT and in 4 on DDS, while 6 patients in each group comprising 22.2% of those on MDT and 25% of those on DDS monotherapy showed excellent responses with more than 90% histological resolution. Thus, the responses in both treatment groups were comparable. Follow-up observations up to 2½ years were available on 25 patients in the MDT group and on 23 in the DDS group. These data are summarized in Table 5. An excellent response was observed in 32% of those receiving MDT and in 70% of those on DDS monotherapy. Overt disease activity (< 60% resolution) was evident in 5 of 25 patients on MDT, while only 2 out of 23 patients on DDS monotherapy showed persistence of disease activity at 2½ years. Thus a distinct difference in therapeutic response was noted between patients receiving MDT and those receiving DDS monotherapy. In fact, at the end of 2½ years, 3 out of 25 patients on MDT had to be restarted on alternate modes of therapy. A subset of paucibacillary leprosy patients who presented with a single patch was chosen for this study since such patients constitute a clinically well-defined and distinct group. 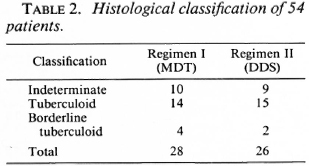 The clinical and histological classification, however, spread across the spectrum of paucibacillary leprosy. The majority of patients had the tuberculoid type of leprosy. Immunologically, most patients were Mitsuda positive. Some patients clinically noted as Mitsuda-negative respond-ers, because of insignificant or no induration at the lepromin site, showed granulomatous inflammation histologically and were therefore considered immunologically competent. Four of five patients on MDT and the two patients on DDS monotherapy who had less than 60% histological resolution at 2½ years were Mitsuda positive (clinically and histologically). Thus, a positive lepromin status had no bearing on the therapeutic response in this study. Katoch, et al. also showed in their study on paucibacillary leprosy that the response to treatment is not influenced by immunological status (3). As shown in the tables, there was clinical, histological and immunological parity between the groups receiving therapeutic Regimens I and II. The two assessment time periods presented here were chosen because 6 months represents the time at which treatment is stopped in the MDT regimen, and 2½ years represents the time when patients on MDT are normally released from surveillance. At the end of 6 months, 33.3% of the patients on MDT and 37.4% of those on DDS monotherapy showed no response or only a poor therapeutic response, while 66.7% of the patients on MDT and 62.5% of the patients on DDS monotherapy showed a good-to-excellent response. Thus, there were no significant differences between the two groups after 6 months of treatment. At the end of 2½ years, only 32% of those on MDT showed an excellent response as against 70% with an excellent response in the DDS group. Further, 20% (5/25) of the patients on MDT showed definite histological evidence of activity of the disease at the end of the 2½ -year follow-up; whereas only two patients (8.8%) in the DDS group had evidence of active disease at the same period. The type of leprosy did not appear to influence the treatment response. In both groups poor responses were noted in indeterminate and tuberculoid leprosy and excellent responses were noted in indeterminate and BT leprosy. The results in this series showed no significant difference in response rates in the group on MDT versus the group on DDS monotherapy, since 20% in the MDT group continued to have active disease at the end of 2 ½ years. A poor immune status as judged by the Mitsuda reaction is not necessarily a major disadvantage to all leprosy patients in combating their disease since, even in the presence of a poor immune status, some pau-cibacillary leprosy patients can be cured with adequate treatment. It is well known that fixed-duration MDT may not necessarily show itself to be superior to DDS monotherapy and, in fact, at the end of 6 months of treatment for pau-cibacillary leprosy the results were similar in both groups. The advocates of the currently employed MDT (6, 8) believe that patients on MDT who show clinical, histological or bacteriological evidence of disease activity at the time of stopping treatment will continue to improve and, therefore, that evidence of such activity does not warrant continuation of treatment. As noted by others (2,4,5), and in our series also, there appears to be a certain percentage of patients who have a poor response even in the MDT group and may need additional or alternate forms of therapy. In our present series, three patients in the MDT group had to be given alternate modes of therapy. There is an urgent need for further studies to assess newer antileprosy regimens and, indeed, several studies are under way in this regard (1). Acknowledgment. The authors wish to acknowledge the help rendered by Dr. P. S. S. Sundar Rao for the present study. We also wish to thank Mrs. Linda Robert for typing the manuscript. 1. Baker, R. J. The need for new drugs in the treatment and control of leprosy. Int. J. Lepr. 58(1990)78-97. 2. Katoch, K., Ramu, G. and Ramanathan, U. Chcmotherapcutic trials with different regimens containing rifampicin in paucibacillary type of leprosy cases-a preliminary report. Indian J. Lepr. 57(1985)499-506. 3. Katoch, K., Ramu, G., Ramanathan, U. and De-sikan, K. V. Comparison of three regimens containing rifampin for treatment of paucibacillary leprosy patients. Int. J. Lepr. 55(1987)1-8. 4. Pavithran, K. Relapse of paucibacillary leprosy after short-course multidrug therapy. Indian J. Lepr. 60(1988)225-229. 5. Pavithran, K. Multidrug therapy for paucibacillary leprosy: WHO regimen inadequate? (Letter) Lepr. Rev. 58(1987)306-308. 6. Revanker, C. R., Ganapathi, R. and Naik, D. D. Multidrug therapy for paucibacillary leprosy: experience in Bombay. Indian J. Lepr. 57(1985)773-779. 7. Ridley, D. S. Skin Biopsy in Leprosy. 2nd ed. Basle: CIBA-GEIGY, Ltd., 1985, pp. 45-50. 8. WHO Study Group. Chemotherapy of leprosy for control programmes. Geneva: World Health Organization, 1982, Tech. Rep. Ser. 675. 1. M.B.B.S., D.D., F.R.C.P. (G); Department of Dermatology, Christian Medical College & Hospital, Vellore 632 004, South India. 2. M.B.B.S., M.D., M.N.A.M.S. ; Department of Dermatology, Christian Medical College & Hospital, Vellore 632 004, South India. 3. M.B.B.S., M.N. A.M.S., Professor and Head, Department of Dermatology, Christian Medical College & Hospital, Vellore 632 004, South India. Reprint requests to Dr. George. Received for publication on 29 June 1990. Accepted for publication in revised form on 4 January 1991.